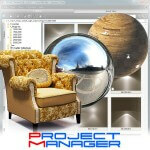 Project Manager is finally released! Speed up starting the utility. Adds the ability to hide all panels with the F11 key. Interactive updating of contents of a folder at change of the text of the filter. The replacement settings of objects are requested in dialogue immediately before the replacement. More informative messages about the operations on files and folders. More informative text in the status bar . Adds the virtual folder Favorities to store links to files and folders. Standard features Windows Explorer at work with files and folders. Files and folders can now copy, rename and delete. Standard Windows dialogs for working with files and folders. Adds support to Drag&Drop at work with files and folders. Interactive update the contents of the folder when adding, deleting files. Speed up loading folders tree in navigation panel. Render Thumnail now works in the menu. Adds the ability to save model to library with viewport screenshot. Adds the ability to translate path to local or network, including the output files. **For example, if a folder contains images of very large size, the user can exit the folder and going back there again some time later. He sees that the images are loaded immediately! Related to "Project Manager is finally released!"